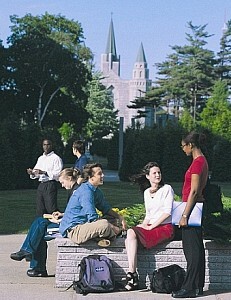 The first French-language university in North America and first university in Canada, Université Laval offers over 350 programs to 36,000 students. It is one of Canada’s largest teaching and research universities. It traces its history back to 1663, when Monseigneur de Laval, the first bishop of New France, founded the Québec Seminary. The year 2007 marks the 100th anniversary of the founding of the university’s school of surveying at the instigation of the corporation of land surveyors, which was the first university-level school of land surveying in North America. It has developed over the years, and is now known as the Département des sciences géomatiques (Department of geomatics sciences), part of the university’s Faculty of Forestry and Geomatics. It is the only French-language department in North America to offer Bachelor’s, Master’s and Doctoral programs, and the only department in Québec that trains land surveyors. With its wide range of programs and research teams, it is recognized as a leader in the field, within the French-speaking world and internationally.